At Dura Supreme Cabinetry, we track trends and color forecasts to make sure our finish palettes and designs are fresh and current. In addition, we monitor trend developments in all areas of the home, especially those products that affect or influence kitchen design. Like anything, trends evolve and change over time. Some flash onto the scene and quickly fade, while others gain widespread acceptance and become part of mainstream fashion or design. One such mainstream trend is transitional design for home interiors; sleek lines, simple styling and minimal ornamentation. Transitional styling has definitively become a prevalent and popular design theme for home interiors and kitchens. 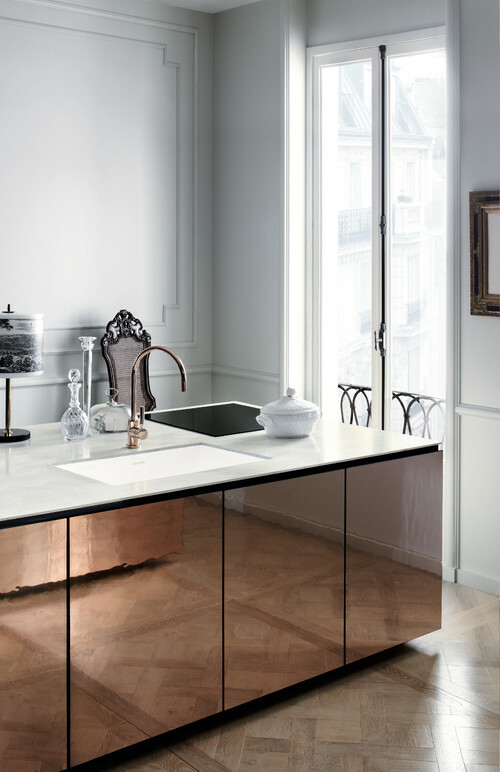 Countertops too have followed this trend toward transitional styling with several key elements. Yet another trend is the overhang. Traditionally, countertops were designed according to their purpose which is to provide a hard, durable surface for food preparation and to protect the face of the cabinetry from spills. Typically, a countertop protrudes past the face of the doors and drawers so that any spills from the counter drop directly to the floor where they can be easily wiped clean (instead of dribbling down the face of the cabinets and hardware). 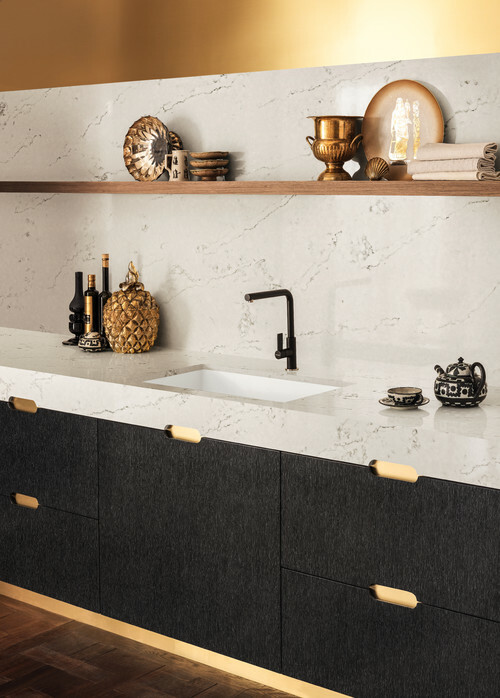 With Transitional design being such a popular look, some designers and homeowners are opting for countertops with little or no overhangs, to emphasize the flush, sleek design. This can be a stunning look as long as the homeowner is aware of the disadvantage of not having an overhang and is willing to sacrifice function for design. Below are a few examples of flush countertops (with no overhang). Another prevalent trend in countertops is the use of a "waterfall' countertop. Where the counter comes to the edge of the cabinetry and then runs down the vertical face to the floor. If you love the color and pattern of your countertop choice, this is an intriguing way to extend that color to a vertical surface. The final trend in countertops is using varying countertop thickness within the kitchen. Traditionally, countertops are fabricated at 1 1/4" - 1 1/2" thick. But today, designers and homeowners are choosing to vary the thickness (thicker AND thinner) to create a subtle yet intriguing focal point. Using a thicker countertop for the kitchen island is a popular application because it helps emphasize the island making it a statement piece.